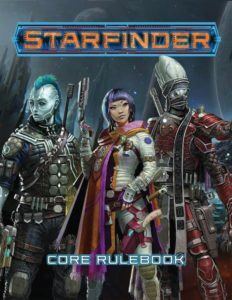 Paizo releases Starfinder RPG this week! You are here: / Role Playing / Paizo releases Starfinder RPG this week! Take your favorite fantasy RPG to the stars! Set thousands of years in Pathfinder’s future, Starfinder is a stand-alone roleplaying game evolved from the Pathfinder rules and designed to bring you a whole new universe of science fantasy adventures. Play alien races both new and familiar as you explore the mysteries of a weird galaxy. Will you be an android assassin fulfilling corporate contracts, or a plucky ratfolk mechanic? A spellhacking lashunta technomancer, or a rakish human pilot? Uncountable worlds are waiting for you and your intrepid crew! Previous Post: « That Back Issue Sale Thing is Happening!